Lo Han sweetener is a healthy sugar substitute recently introduced into America from Asia. Also called Lo Han Guo, or Lo Han Kuo, it's made from the fruit of the "siraitia grosvenoril plant which is native to China and northern Thailand. As natural sweeteners go, it looks to be one of the best in terms of it's sweetening power and health affects on the body. Sometimes referred to as “longevity fruit” it has been used in Chinese medicine for centuries to treat diabetes and obesity, lo han guo is 300 times sweeter than sugar thus lo han sweetener is an effective, low calorie replacement for sugar. Lo han kuo is a cultivated plant and the locals in the areas in which it is grown have a high number of centenarians (people who have lived 100 years or more). This adds to it's reputation as a food that promotes longevity. This and it's use in Chinese medicine suggests that not only is lo han not bad for you, but in fact it may actually be health promoting, providing at last a truly healthy way to sweeten your foods! The sweetness of the fruit comes from triterpene glycoside compounds called mogrosides. These compounds make up about 1% of the fruit, but are extracted into a powder which is 80% mogorsides which gives lo han gho its potent sweetness. Lo han guo is classed by the FDA as a GRAS (generally recognized as safe) product. Thus there are no restrictions on it being used as either a food or sweetener. It is stable enough under heat to be used in cooking and is very low calorie, which is perfect for people on low calorie diets that want to use a healthy sugar substitute. Some companies may use maltodextrin in their lo han products and other natural sweetners, and for anyone who is sensitive to corn this may be a problem, so read the labels very carefully and inquire about ingredients of the product before you buy it. 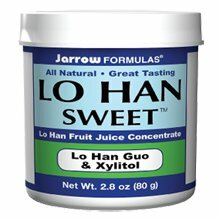 Lo han sweetener is available from several companies. An 80 gram (2.8 ounces) jar will run you between $5 and $10. Swanson Premium also makes a formulation that contains lo han and inulan. All things considered, lo han guo may just be the healthy sugar substitute you have been looking for. If you try this product, be sure to share your experiences with us! *Yao Xue Xue Bao. 2009 Nov;44(11):1252-7. Insulin secretion stimulating effects of mogroside V and fruit extract of luo han kuo (Siraitia grosvenori Swingle) fruit extract.. Zhou Y, Zheng Y, Ebersole J, Huang CF. Source: College of Life Science, Guizhou University, Guiyang 550025, China. *Luo Han Guo fruit and its benefits, review of side effects by Ray Sahelian, M.D.